Granada, the south eastern Spanish city which takes siestas very seriously! Granada sits at the foot of the Sierra Nevada mountain range. 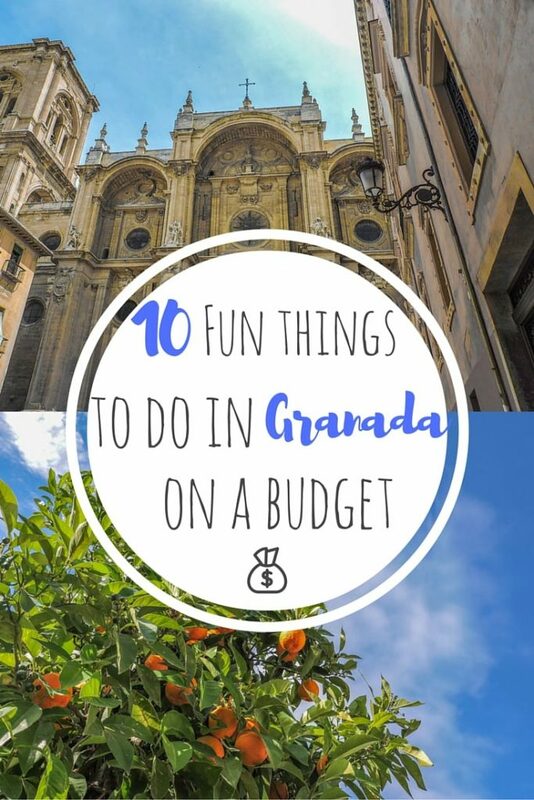 Not as bustling as Barcelona, but there are certainly still fun things to do in Granada on a budget. It’s close proximity to the coast (Marbella and Malaga) make it a very appealing city/beach trip. Without paying for it! Ordering a round of drinks in Granada comes with a plate of tapas. This plate can be anything from small hamburgers to fish and breadsticks. One of the limited free things to do in Granada. Since we were dog sitting in Granada to keep our travel costs down, free tapas were greatly appreciated! Sangria is for tourists, Tinto De Verano is for locals. The Spanish love this red wine diluted with soda and lemon (above image). When summers reach highs of 40 degrees, you’ll appreciate this refreshing beverage. On average, a glass costs €2 and is sold everywhere! For an alternative, but more expensive drinks, check out Bohemian Jazz Cafe. This bar just oozes cool with its throwback decor and eclectic soundtrack (cocktails €6). Top of everyone’s Granada travel guide bucket list is a visit to the Alhambra. You can’t miss the palace of Granada, literally. It overlooks the city from the top of the palace grounds (which make for a nice nature walk for those on tight a budget). The fortress was originally built by the Romans but further developed by the Moors. Palace tours are very popular in Granada. It is advised to get up early to avoid waiting in long lines, especially in the hot sun. Alternatively, you can skip the line and book a guided tour here before you go with GetYourGuide. If the above option has sold out (honestly, the Alhambra gets very busy during the summer months), you can try this slightly more expensive ‘line skip’ ticket and tour. Both tours include a walk through the Generalife Gardens as well as a local tour guide discussion about the history of the palace. 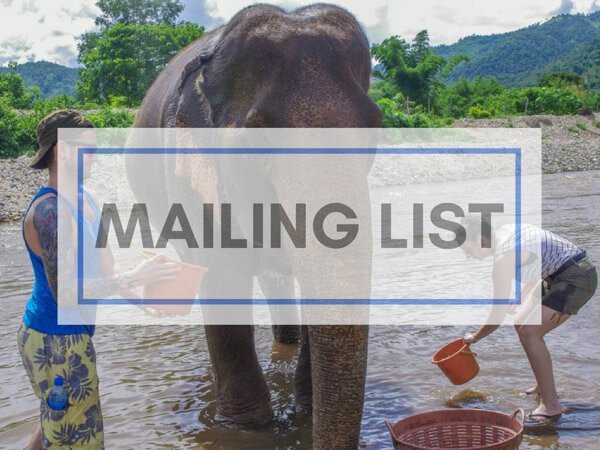 Tickets are sent instantly and you don’t have to print them out. English or Spanish not your first language? No stress, tours are also lead in French and Italian. 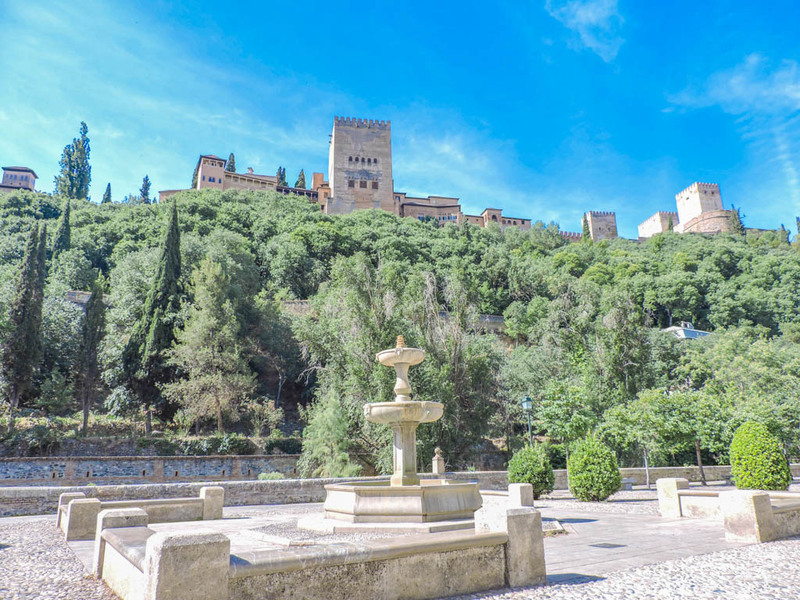 A visit to this UNESCO World Heritage Site is the #1 thing to do in Granada on Trip Advisor. Check out tips on purchasing Alhambra tickets. Plaza Nueva in Granada is a tourist hub of restaurants, ice cream shops, and a meeting point for many of the tours in Granada. Sip a cerveza and watch the world go by. 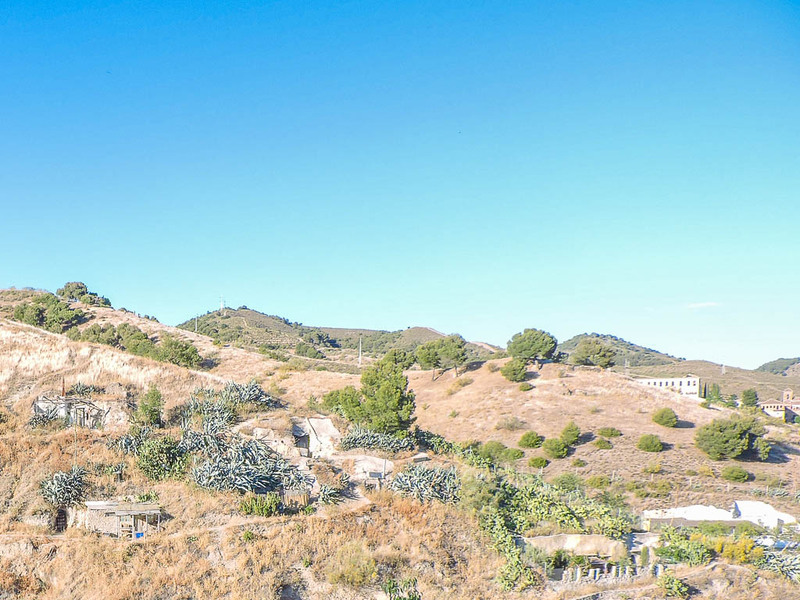 There are several companies that offer walking (or segway) tours in Granada but the one I highly recommend is the tour of Sacromonte – the gypsy caves of Granada. 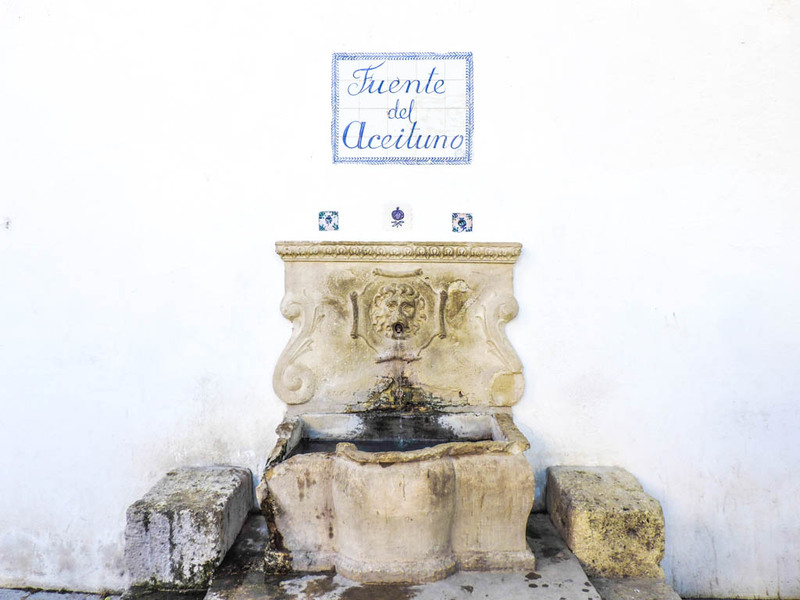 This 2.5 hour walking tour meets at a central point in Granada and teaches you about the history of Albaicín and Sacromonte. The local guide also discusses what life is like to live in the caves dug into the mountain, where some people still live today! Although the path is tight at times, a family with a young baby and pram managed it (massive kudos to them!) You see incredible views of the city, including the Alhambra. Read more below. For six centuries, immigrants have made their way to Granada and found refuge in the Cerro de San Miguel hills. Rejecting the norm, these gypsy travellers dug into the mountain and created homes. In the beginning, there were 1000 cave homes, after one earthquake and two floods, there are now approximately 150 caves (some with solar panel electricity!) The prime location of these caves put these ‘modern gypsy’ homes at stake. If the men in suits have their way, the Sacromonte gypsy caves will no longer stand so visit quickly. Could you live in a cave? Book your tour here. 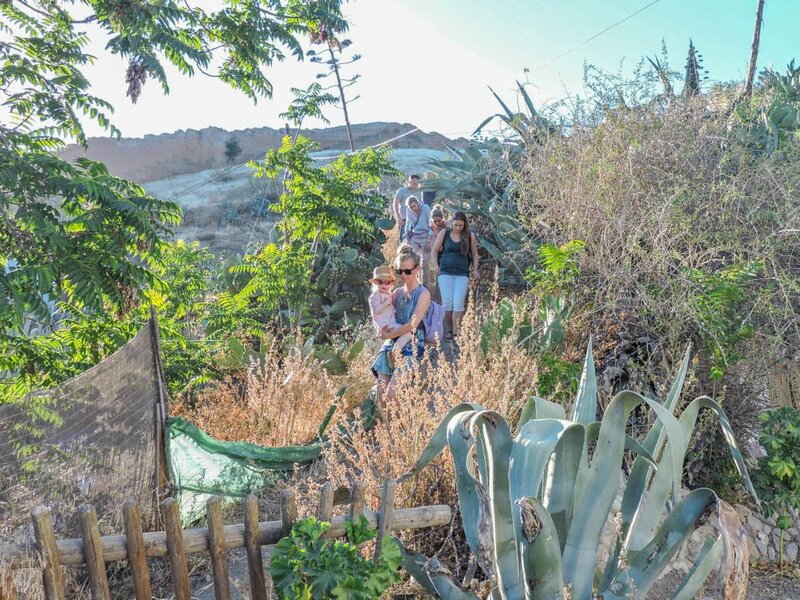 I highly recommend taking this hike to Sacromonte because you walk through the white houses of the Muslim area, see the best views of Granada (especially the Alhambra) from the top, and get an insight into how the bohemians of Granada live. There is even a bar! 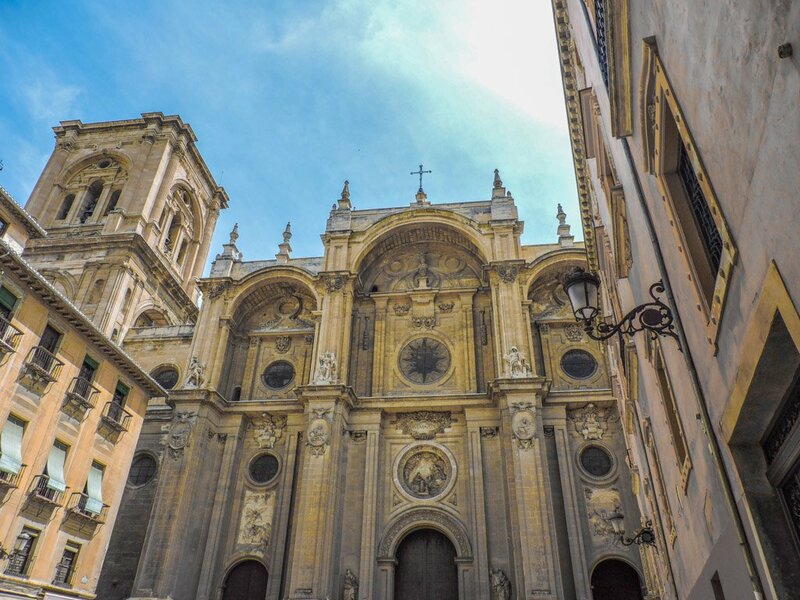 Granada Cathedral or Catedral de Granada is imposing and difficult to miss! The dramatic building is 115.40 m long and 65 m wide. Beat that city angst away by clicking your fingers along with a flamenco show in Granada! This dance is partially native to the Andalusia region and there is a gig for every budget. Most of Granada’s flamenco shows take place in the Albaycín area. It is expected that guests are silent during the performance which consists of dancers and a musician. Shows can be found a low as $20 and can be booked before you go to ensure you get a seat! Choose your preferred time here. One of the best things to do when it rains in Granada. A short bus ride from Granada will take you to the scenic town of Monachil. 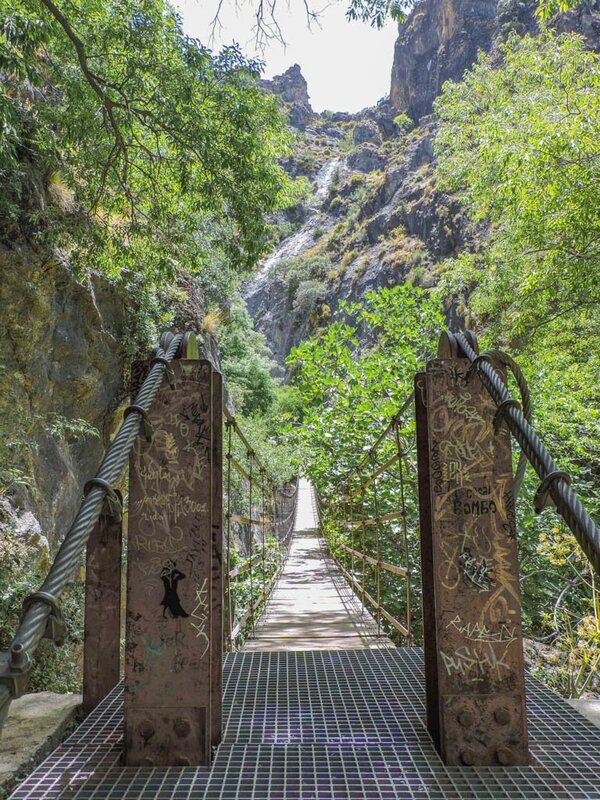 From here there are several hikes along the river which involve crossing a few rickety rope suspension bridges called the Hanging Bridges of Los Cahorros! Take your swimming gear to cool off. One of my favourite places to go in Granada. 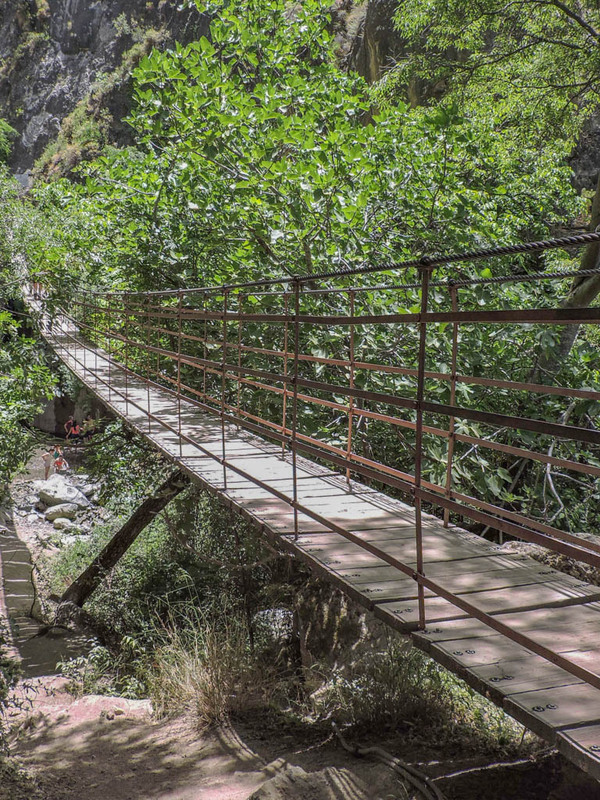 If you like hiking, read our day trips from Barcelona for other ideas of Spanish routes. Monachil has lots of small bars to award yourself with a beer. A personal favourite was Art Café Barbershop (don’t expect a haircut!) 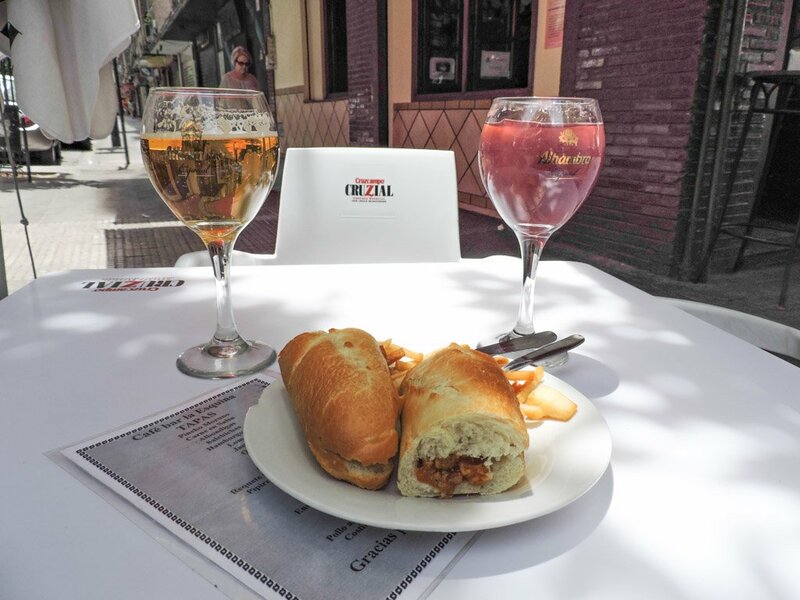 Two beers and one Tinto De Verano was €6, with tapas of course. 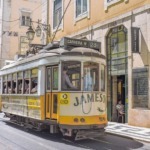 Airbnb averages at €77, however, private houses are available from €29. Yet to sign up for Airbnb? Use my code and get money off! I will also get credit as a thank you! Camping in Granada is possible. Do take this warning about hot summers carefully though! Granada is easily discovered by foot and excluding the Alhambra and Sacromote area is pretty flat. 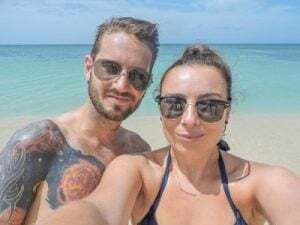 There is a bus system which operates in Granada and connects the city to the coastal beaches of Malaga (you can then go on to Marbella). Taxis are also available all over the city. Granada has its own airport but flights are pricier than flying to Malaga. Buses from Malaga to Granada are very frequent. Buses also make the reverse journey. There are plenty of spots to pick up a map of Granada. Here is an online version for the very organised traveller to print off! Spain is in the European Union and uses the Euro. Most ATMs charge you to take out money, with the exception of BBMV. For the most up to date exchange rates, click here. Ooft! Granada summers are hot! The maximum temperature reaches 39 degrees and the lowest of the year dips to a mere 18 degrees. The rainiest month is November, with July showing little signs of a downpour. 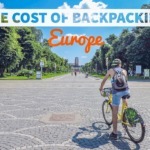 Heading elsewhere in Spain? 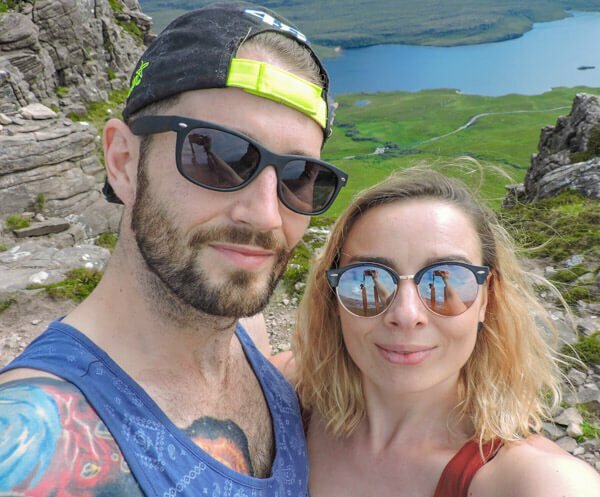 Check out this Valencia Travel Guide – I’m keen to go, Craig has already visited to see the Moto GP! Hover over image and pin to your Spain Pinterest board! Granada would make a perfect two or three-day city break merged with a beach holiday – close to the coast it would be rude not to! 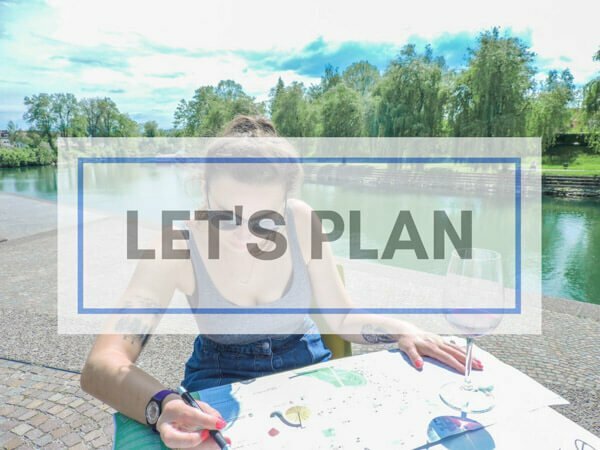 So now you know what to do in Granada, Spain – get booking, rapido. 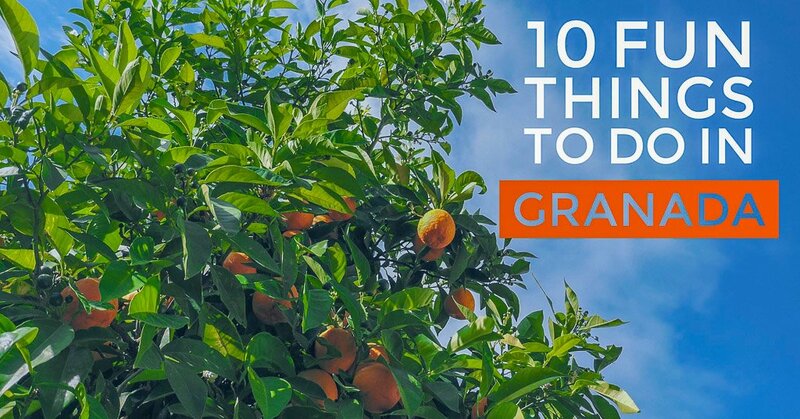 Have you been to Granada? 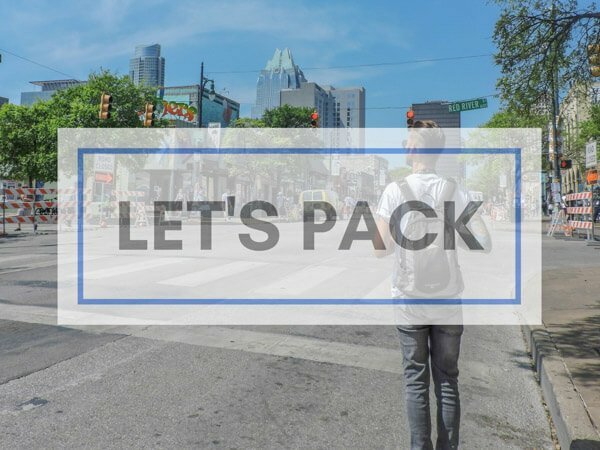 Any questions – hit me up in the comments below! So the picture at #1 with the free tapa’s, that’s what you got for free with your drinks? I’ve never gotten a full plate with any of my drinks:P I recently created a top 15 on Granada as well. Oh really? You missed out! We spent nearly a month in Granada so our bellies were full of tapas! Thanks for reading. Haha! Do a fly by observation beforehand! How long does it take to get from Granada to Monachil by bus? If you can work out the bus times… around 45 minutes for the bus ride. I live in Granada and it’s been in the 40s all week, so maybe your temp is a bit conservative. Also, you can’t take a bus to Marbella, you’d need to go to Malaga and change, it’s a bit misleading to say buses go to Malaga, Marbella etc. That’s true, we did make that change at Malaga. I’ll add that to the post, thank you! We are having a heat wave here in the UK, you may of heard on Twitter LOL. Great tips!! Looking up tickets for Alhambra now. Can you recommend a good tapas bar? Thanks! Gracias! Do you mean a bar that gives tapas with drinks? There’s so many to be honest and they pretty much offer the same. we didn’t eat in a tapas bar like we have here in Scotland that serves small plates for dinner, just as snacks with drinks. Yep, that’s what I meant. I didn’t realize there were so many!! I found a bunch just by walking around. I was super impressed! First time I’d experienced it. I will be going to Granada Spain on 23 to 27 July 2018 for a conference. I am just a student hence I am looking fornany cheap eats near Hotel Granda Center or University of Granada.Are there any groceries near the area?Thank you.Lastly,what is the nearest international airport in Granada?I am coming from Japan. :) I will just go to Spain Embassy in japan by first week in May. ;) Thanks in advance. Wishing you a fun break Jo! Malaga is your closest airport. Lots of bars offer tapas with drinks which keeps costs down. I love going to Alhumbra ! I really didn’t know about this building inside the Alhambra complex. The gardens were spectacular. I had the impression we passed far too fast through to really enjoy it.